On to the semis! The Wildcats celebrate their 2-0 win over Portland in traditional style. Photo by B. Butler Danes. 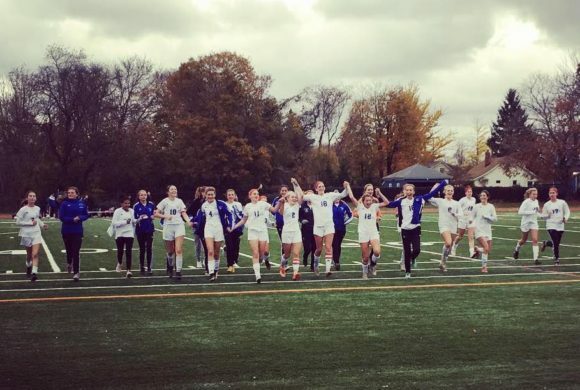 Defending Class S champions Old Lyme defeated Portland 2-0 Friday afternoon in the CIAC Class S quarterfinals. Britney DeRoehn scored both Wildcat goals with one assisted by her sister Emily DeRoehn. Both goals were scored in the second half. Britney DeRoehn scored both goals in Old Lyme’s quarter final against Portland. File photo. Sam Gray was in goal for Old Lyme and notched eight saves, while Kelly Boutin tended goal for Portland making 13 saves. 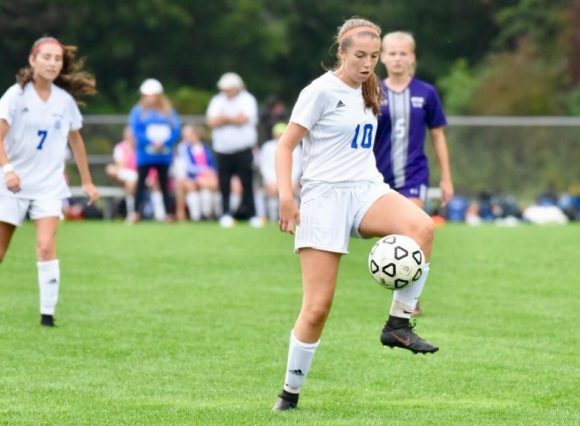 Old Lyme, seeded #14, now advance into the semifinals and will face seventh-seeded East Hampton Monday evening at 6:30 p.m. at Fitzgerald Sports Complex in West Haven. The other semifinal will be between #4 Immaculate and #17 Coginchaug and will also be played on Monday.